← Medieval MP of the Month: Walter Rich – a tryst gone wrong? Ahead of tonight’s Parliaments, Politics and People seminar at the Institute of Historical Research, we hear from James Smith, a doctoral candidate at the University of York. He spoke at our previous session on 5 February about his research into a four nations history of Westminster. In 2003, Joanna Innes published her ground-breaking Neale lecture, ‘Legislating for the three kingdoms: how the Westminster parliament legislated for England, Scotland and Ireland, 1707-1830’. Its most important suggestion was that in an age of ‘four nations’ (England, Wales, Scotland, Ireland) or ‘three kingdoms’ (England & Wales, Scotland, Ireland) historiography, an investigation of the legislative contours of the long eighteenth century offered a fruitful subject for exploring how the union was perceived and constructed within the unitary, multinational Westminster parliament, in Scotland’s case from 1707, and Ireland’s from 1801. Innes’s analysis paused on the eve of the parliamentary reform ‘crisis’ of 1830-32. Although the precise significance of that event has been much debated by historians, the separate English & Welsh, Scottish and Irish statutes which arose as a result were unquestionably seen by contemporaries as marking a new era in the politics of the United Kingdom. Indeed, the alterations in the relative numbers of Members returned from each of the four nations formed one of the most hotly-debated subjects at Westminster throughout the crisis. It is no coincidence that the Whig government’s initial reform bill foundered in April 1831 on the very question of augmenting the Scottish and Irish representation, ostensibly at the expense of English MPs. 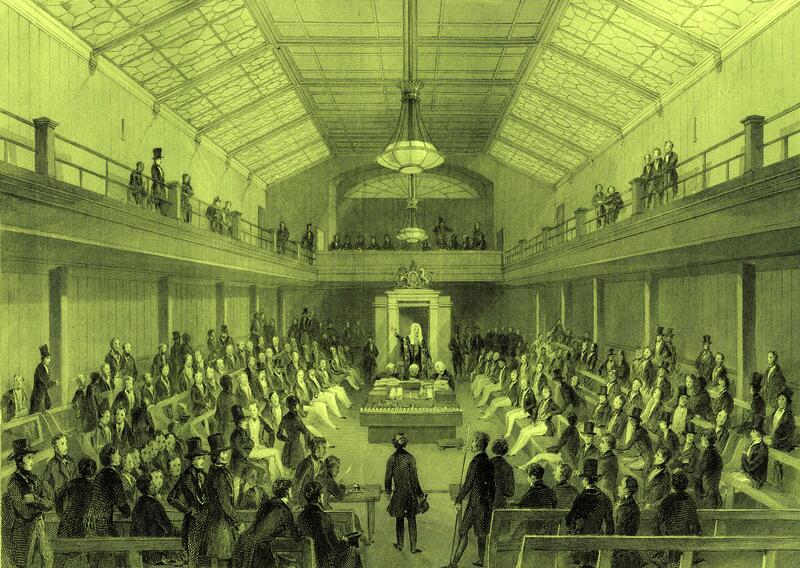 Yet, despite this sense of parliamentary reform marking a significant recasting of the political relations of the four nations, we know relatively little concerning its effects on the broader legislative landscape of the union during the 1830s and 1840s. My paper sought to begin to address this deficiency by building upon the sorts of quantitative and qualitative analyses pioneered by Joanna Innes and Julian Hoppit for the preceding century and a half. At the core of my research is a relational database containing details concerning every public general bill ordered for introduction to the imperial legislature at Westminster between October 1830 and July 1852. Of the information noted for each entry, which includes the bill’s title, the session in which it was introduced, its ultimate fate, a subject category, and the MPs associated with its sponsorship, the most important for the purposes of my paper was its proposed or realised geographical ‘reach’. As both historians and contemporaries have noted, determining which nation(s) legislation was designed for is not always straightforward, since parliament itself often appeared to give insufficient consideration to the subject. Nevertheless, by examining the various iterations of legislation introduced, as well as by consulting Hansard, and a selection of contemporary legislative manuals, it has been possible to assign geographical remits to some 95% of the measures brought in between 1830 and 1852. My paper presented some of the initial findings that have arisen from this database. In particular, it focused on tracking, explaining and comparing the quantities and character of legislation designed for implementation in either England & Wales or Scotland or Ireland alone. Were similar subjects being dealt with across the four nations at the same time by Westminster? Or was there a marked geographical patterning to the types of legislation being considered? And who, be they minister or backbencher, took the initiative? Of course, measures designed specifically for implementation in a single nation formed only a portion of the legislative output of the imperial parliament during the reform era. What Joanna Innes termed ‘integrative’ legislation, that is, of single measures designed for application in combinations of more than one nation were also significant. Indeed, my findings suggest that acts with either a pan-UK, or joint English (& Welsh) and Irish remit witnessed some of the most noteworthy increases of any legislative type throughout the 1830s and 1840s. In the second half of my paper, I argued for the need to balance such empirical analysis with a more qualitative appreciation, alive to the ways in which the multinational character of parliament left its mark on the legislative output of the reform period via means which elude counting and categorisation. I explored a range of measures which were executed for the most part on a nation-by-nation basis by Westminster but which nevertheless testified to the ways in which four nations dynamics at parliament played an important role in determining their character. For whilst administrative pragmatism often necessitated separate national treatment, that did not prevent certain measures – such as the municipal reforms of 1833 (Scotland), 1835 (England & Wales) and 1840 (Ireland) – being considered as part of larger ‘imperial’ projects. Nor did it prevent acts or clauses designed for one nation being used either in whole or in part elsewhere (e.g. the 1832 English & Welsh Lunatic Asylums Act and the 1842 Irish Private Lunatic Asylums Act). And it certainly did not preclude parliamentary debates concerning national legislation being framed by ideas and precedents drawn from parallel circumstances in the other constituent portions of the United Kingdom. Any examination of the four nations dimensions to reformed parliamentary politics, I concluded, therefore needs to marry the record imprinted in the statute book, with an awareness of the particular dynamics kindled by the multinational character of the Westminster parliament, where even the most ostensibly ‘national’ of measures could be shaped by its wider ‘imperial’ implications, and ‘imperial’ measures could spark the most vociferous defences of fiercely-held ‘national’ rights and opinions. J. Hoppit, ‘Patterns of parliamentary legislation, 1660-1800’, Historical Journal, vol.39 (1996), 109-31. J. Hoppit, Britain’s political economies: parliament and economic life, 1660-1800 (Cambridge: Cambridge University Press, 2017). J. Innes, ‘Legislating for three kingdoms: how the Westminster Parliament legislated for England, Scotland and Ireland, 1707-1830’ in Julian Hoppit (ed. ), Parliaments, nations and identities in Britain and Ireland, 1660-1850 (Manchester: Manchester University Press, 2003). J. Innes, ‘What would a “Four Nations” approach to the study of eighteenth-century British social policy entail?’ in S.J. Connolly (ed. ), Kingdom’s united? Great Britain and Ireland since 1500: integration and diversity (Dublin: Four Courts, 1998). This entry was posted in 18th Century history, 19th Century history, Conferences/seminars, legal history, Parliamentary buildings and tagged British Isles, England, Great Reform Act, House of Commons, IHR seminars, Ireland, Legislation, Northern Ireland, Parliaments Politics & People seminar, Scotland, United Kingdom, Wales. Bookmark the permalink.